There is nothing good like waking up on a bright morning, pouring a mug of coffee or cup of tea and stepping out onto the porch to view the morning sun reflecting off the water. After the constant grind of the past months between work and just daily living, it's lovely to get away. Short term chalet rental accommodations pull people away from all that hustle and slows things down a bit. A little home away from home, whether on the beach, overlooking snow-capped mountains or set up on a lazy lake full of fish, our short-term chalet rentals can be found just about anywhere. After a long day of exploring local shops, restaurants, theme parks, and shows, it will feel great to come back and relax in a place that has all the comforts and amenities of your own home. 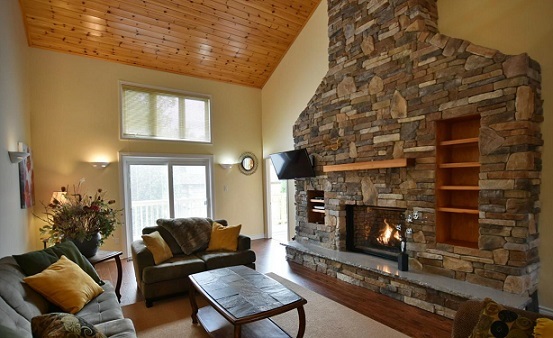 If you enjoy cooking or maybe just want to save money, renting our rental accommodation is an excellent option for your next trip to Blue Mountain Ontario. Many of our rentals offer fully stocked kitchens, so you can easily cook everything from blueberry muffins to crock pot stew. This is especially useful if someone in your group has dietary restrictions. Our separate rental properties give you privacy, which is especially useful for parents wanting a bit of alone time when vacationing with children. The kids can play video games inside while you enjoy a glass of wine together on the balcony. Plus, you don't have to bother about hotel neighbors listening to your conversations on the balcony or joining you in the hot tub. You can choose from a variety of great locations. There are so many exciting things to see and do in Blue Mountain Ontario, and you can find our rental chalet near whichever attraction you want. If you're hoping to spend your vacation enjoying the water at Blue Mountain, find a lodge accommodations here . There are many fantastic and affordable rental options available. With our chalet rentals, you can entertain groups. Because you have extra space, it's easy to host guests when you're staying at a rental property. Invite over a group of friends or family to enjoy the evening with you or host a dinner party. You can have your kitchen party. If you're planning a vacation full of activity, you might end up with some filthy clothes. Our chalet rentals are equipped with laundry machines so that you can easily and inexpensively wash your clothes. This is especially useful if you have very young or accident-prone children, or if you want to pack lightly.Rent an Independent holiday chalet in Blue Mountain Ontario and experience real culinary delights with oodles of dining options. Blue Mountain produces some of the finest produce to be found anywhere in Canada. In Blue Mountain Ontario, you will experience an excellent range of sporting, adventure and leisure pursuits, as well as superb shopping to enrich a visitor stay. Its two main surrounding cities of Collingwood and Meaford provide a year-round destination with its diversity of attractions, entertainments and an endless list of things to come and see. To book your Lodging accommodations click here.